We headed out from our tiny overnight town of Foxton minutes before it started sprinkling. We knew rain was in the forecast but pressed on, hoping to remain on the very edge of the storm. But it was not to be--in a few minutes we were battered by the wind as we struggled on the roadside to don our rain gear in the downpour. As we were finishing the cumbersome process, a middle-aged woman on a racing bike without rainwear stopped to visit. I was shocked that she paused as I was hardly in a chatty mood and being less well prepared, she surely must have been motivated to get out of the rain herself. 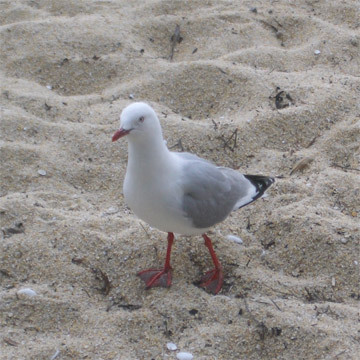 Another friendly NZ face: the native red-billed gull. Sue was on her way home to Levin, which was where we hoped to catch a train to Wellington that afternoon, and she offered to guide us into town. Most riders in her situation would not have wanted to suffer the loss of speed and hence chilling that would come with slowing down to our loaded touring pace, but she graciously did so. I often fantasize about somehow magically being rescued from these dreadful situations and being escorted by a local rider was almost as good. We no longer had to concentrate on the route but only follow her wheel. Sue knew which narrow bridges had through bypasses for bikers and which needed to be crossed only when free of traffic in both directions. Sue kept reining in her pace and took us on a shortcut to her home on the edge of town to dry out. There we hung our rain gear on the covered outdoor clothesline and ate our picnic lunch in her kitchen. We hitched a ride into town when she dropped her college-aged daughter off at work and Sue patiently waited while we sorted out the transportation situation with the tourist info woman. The 1 train through town wouldn't arrive until dinner time, so we hoped instead to get on a bus with our bikes. The info person wasn't optimistic that the bus coming through in an hour would take us, but we would poise ourselves for the trip anyway. The first of several buses through Levin would be small and we organized ourselves to travel on different buses, hoping that we'd both make it to Wellington that night. We'd never split up like that before, but it seemed like the right place to exercise that rarely considered option, rather than holding out for "all or nothing." Once back at her house, we thanked Sue and headed out into the rain on our bikes to the bus stand at the local Mall. As seems to be standard in New Zealand, the bus was about 20 minutes late but just as characteristically, the friendly driver happily made room for both of us, our bikes, and all of our dripping gear. We were thrilled. The ugly morning in the rain had ended with help from a stranger and we were tucked away in a steamy bus on our first attempt to board. We sat out the worst of the storm on the bus, which was 65mph gusts and 0.4" of rain in 1 hour from the dreaded southerlies. The rain stopped and the skies cleared en route, but the baseball-sized balls of sea foam that blew onto the bus windshield reinforced it was no weather for biking. Amazingly, it was warm and sunny when we arrived in Wellington, as the tempest had passed through an hour earlier. Almost all of our wet gear dried in the still brisk wind while we reloaded our bikes for riding. 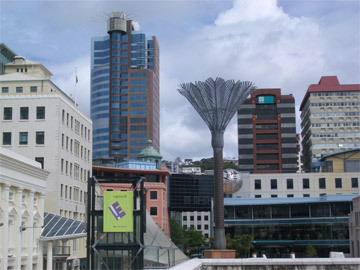 Looking inland from Wellington's portside promenade. The Wellington tourist info folks came through for us as we knew they would, and we were promptly booked into a business hotel across the street from their office, taking advantage of the weekend rates. The dynamite location allowed us to quickly deposit our gear and begin exploring the city within an hour of arriving. Wellington was a special stop for us as it was the first city we'd been in for some time and would be our departure point for the South Island. It was also created a pause for looking back at our time on the North Island. We immediately were captivated by downtown Wellington with its central, people-friendly waterfront. The city planners had beautifully blended the current industrial port scene with the public spaces created from the old wharfs. The architecture of the surrounding commercial area framed the public spaces with interesting shapes rather than engulfing them as was the case in Auckland. And one end of the extensive bike and pedestrian promenade was occupied by their relatively new Te Papa museum, which was perfect for us. The museum's grand location and free admission had us spending hours over 2 days filling-in missing pieces of New Zealand's history. Along with the serious treatment of many environmental and historical issues, there were lighter displays like the "Sheep Cam." The Sheep Cam has got to be on the Top 10 List of Dumb Things People Have Done, but we were in stitches watching it. It was a series of 5, 1-2 minute video clips of the world through a sheep's eyes as a camcorder had been strapped to the top of a sheep's head. One segment was mostly of another sheep staring incredulously at the camera on its pen-mate's head. Another was mostly the sight of grass as it featured the view from the sheep while it was grazing. And it was a wild ride as we bounced along during the segment in which our host sheep was being herded by a dog. It wasn't the least bit instructive, but it sure lightened the mood from pondering the details of the volcanic history of New Zealand and that of the friction with the Maori. The Kiwi's love of corrugated steel is captured on this car. 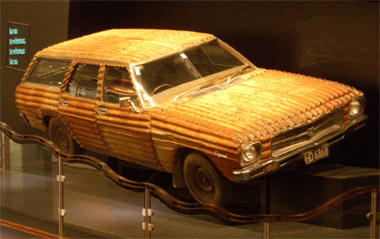 The Te Papa Museum is also home to a regionally famous car covered with corrugated steel. Bill thought I was nuts when I asked him to snap a photo of it for me, but my reason in doing so was the same reason that the car exists. The Kiwis are eminently practical and we'd seen an abundance of corrugated steel by the time we'd arrived in Wellington. In use in New Zealand since the 19th century, it is often employed for home roofing and occasionally as siding and fencing. Of course, odd bits frequently show-up in other applications. And, probably only in New Zealand, a "mini" version of it is being used in interior applications, including shower stall liners and sink backsplashes. I'd pondered how to capture the love of this material that had been iconic for New Zealand in my eyes and voila! there is was--the corrugated steel car. Yes, the corrugated steel car that formerly plied the roads of New Zealand before finding a home in the museum is but 1 symbol of the New Zealander's pragmatic approach to life. Another solution that caught my eye as we traveled towards Wellington was the underpass for cows. We had turned down a gravel road for a break from the roar on a busy truck route when I noticed a line of cows in the distance heading towards us but then disappearing. It was a puzzling sight that pointed to a novel answer when the cows began reappearing on our side of the road. I scrambled to catch a photo of them and was able to chat with the young farmer bringing up the rear on a motor bike with his dog. Cows nonchalantly emerging from under the main highway. 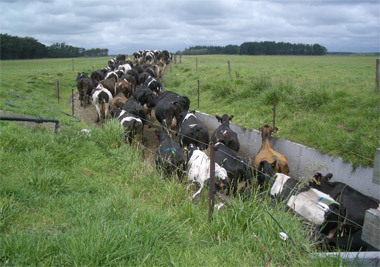 The farmer paid for the crossing himself to the tune of about $15,000-20,000NZ. He didn't think it was too expensive for what he got. He did think the 6 month planning and paper work process was excessive, but the actual construction time was under 36 hours. The bulk of the expense was related to traffic control for the obstruction of the busy road while the underpass was constructed. His said his was one of many we would see while in New Zealand, but this was our 1 and only cow underpass. The farmer who owned the cow underpass readily stopped to answer my questions and that friendly approachability is typical of what we'd experienced in New Zealand. No doubt about it, Kiwis are a nice, friendly, helpful group of people. They are easy going and welcoming to visitors. One shouldn't think twice about asking for or accepting help from others when in New Zealand as they are willing to spare a few minutes of their time. The New Zealanders aren't however always overflowing with information. We all but gave up asking the locals if they knew what the weather forecast was, as they often looked to the sky in front of them for their information. We of course laughed to ourselves when one predicted a lovely day without noticing the approaching storm that engulfed the sky behind them. And we couldn't help but think "He doesn't get out much" when an official's reply to my query about the grade on the trail around the lake was a brief lecture on lakes being flat. Maybe their trail stays at the water level, but many a road and path along water don't. And the Kiwis seemed a little short on curiosity and long on accepting what is at the moment, but that no doubt contributes to their calm demeanor. One aspect of their easy-going culture that unnerved us was the lack of paper-trails and receipts. We often booked rooms at the tourist office, paid for them in advance, and were given a voucher. When we checked-in, we handed over the voucher and that was the last shred of proof-of-payment we had. In one situation, the voucher covered nights 1, 3, and 4 of our stay in the area and so we had nothing to produce when we returned for night #3. In Rotorua we paid for a round trip bus ticket out to the kiwi exhibit but were given no ticket for the return trip. Indeed, there was never a problem, but we were stunned nonetheless. We'd forked over as much as $560NZ at a time for several days of services and had no receipt of any kind. We haltingly learned to trust the process without protesting but we still clutched now and then from the lack of a piece of paper in our hand. But even before the friendliness of the people, one notices their British heritage. No doubt, to Brit's the former colony has lost too much of the old country's ways, but it looks decidedly British to us, from the food choices to the accent to the vocabulary and oh, yes, that driving on the other side of the road. One very un-British aspect to the New Zealand culture is the prevalence of going barefoot. Little kids and grandma can all be seen barefoot in the grocery stores (something forbidden by health standards in at least some parts of the US.) Rain or shine, hot or cold, we saw people of all ages going shoeless everyday. Most were children, but definitely not all and it's a practice equally shared by those of Polynesian and European ancestry. In keeping with the barefoot bias, it appeared that many school uniforms gave the option of wearing a very thin soled, lightly constructed leather sandal. Even the McDonald's TV ad used the New Zealander's love of going barefoot as a reference point. It's great for us as our lack of real shoes never resulted in stares in New Zealand as in Europe. In many of the countries we visit, there is some health issue visible on the sidewalks that grabs our attention, something that seems to speak volumes about the habits or cultural issues in the region. In Egypt this spring, it was the sad sight of adults with crossed eyes that needed to have been treated in childhood. On our first visit to Germany in 2001, we were stunned by the number of older adults who had clearly suffered from strokes, no doubt from the high saturated fat diet. In the Czech Republic, we were amazed at the high incidence of people in late-stage alcoholism that were out and about (and many still drinking.) In New Zealand, it was the horrific sight of people suffering from far, far too much sun exposure that riveted our attention. Daily we'd see people on the sidewalks that had sun damaged skin like we'd never see before, but it was in the grocery stores each afternoon when I felt like I was visiting a specialty ward for severe skin disorders. It was the sight of the older women that stopped me in my tracks--presumably the women because they had out-lived their mates with shorter life expectancies. And presumably I was mainly seeing these women at the markets because ageing was limiting their public activities to the most essential ones and because as older people, they had accumulated more sun exposure. One motel hostess in her 60's casually spoke of the dozens of stitches she's had on her face in the process of having skin cancers removed. New Zealand is one of the areas around the globe paying the highest price for the human activities than have thinned the earth's protective ozone layer. Chlorofluorocarbons released into the atmosphere from refrigeration and aerosol propellants are among the many culprits destroying ozone. Antarctica and nearby New Zealand have much higher UV exposure than they had fifty or 100 years ago, with one commentator saying that UV exposure in New Zealand can be 40% greater than in Europe. We were stunned at the UV ratings on the nightly news, with the next day's forecasted UV exposure always predicted to be either 11, 12, or 13. I believe the scale tops out in our northwest corner of the US at 10, with a given day's rating generally being in the low to middle range. Even on rainy days in New Zealand, the UV exposure will be predicted at 11 or greater in November and December, which is their late spring and early summer. (The UVA rays aren't impeded much by clouds.) On a day when the UV rating were running 11, the recommendations printed in the newspaper included "rescheduling outdoor activities"-- hard to imagine that ever happens since we hadn't seen a day rated under 11. The thinning of the ozone has been known since the late 1970's and the UV effects that can take decades to be apparent on human skin are all too obvious now in the middle-aged and older population. The look goes beyond familiar wrinkled and crinkled old skin, it is the realm of the severely diseased look that makes one recoil. The severely blotchy pigmentation patterns that alternate between too, too white and odd shades of red looks very abnormal, along with the over-stressed texture. The first few times I saw such skin my mind quickly flipped through the short list of medical conditions that I could recall from my medical laboratory education in my early 20's and there was no match. We of course see damaged skin along the entire continuum, with the other startling group being the 40-50 year old men that have either been working or playing outdoors with unprotected skin. Their skin isn't at the very thin, red and white blotchy stage, but just looks dry and over baked. These are the guys with fair skin that don't really tan but appear to have a permanent pinky sunburn. You can tell from the damaged look of their skin that it isn't just yesterday's sunburn, but one from the last 10, 20 or 30 years. And sadly, even the skin on the faces of some 10 and 12 year old kids revealed excessive exposure to the harsh rays. They didn't have the leathery, permanently damaged look of their parents and grandparents, but their skin lacked the delicate resiliency that should have been there. Several tourists working on their tans also had commented on how harsh they were finding New Zealand's rays to be on their skin. We didn't see much evidence of a campaign to educate New Zealanders to the risks they face. We would occasionally see every kid on a school yard playground wearing a hat, but the accompanying adults were often hatless (amazingly, including the bald man.) And government agencies and businesses with staff outdoors for hours each day didn't seem to have wide-brimmed hats and long sleeves as a part of their uniforms. On the whole the Kiwi's didn't appear to be any more diligent about controlling their exposure than people in countries with more ozone protection. We wondered if there was an emerging theme as we looked in awe at the Kiwi's resistance to modifying their behavior in response to the changing realities of UV exposure and were equally in awe of their indifference to others on the road when behind the wheel We wondered if there was a greater than usual propensity in the Kiwi's to just keep doing what they'd been doing or if there was some other unifying theme. We had found New Zealanders to be remarkably friendly, easy-going people but once given the keys to a motor, the ethic of too many switched to "whoever is biggest wins". In each town or city we visited, we were stunned at how little regard pedestrians received from motorists. In the bigger communities the main road often becomes 4 or more lanes through town and pedestrians were left to fend for themselves in crossing the roads. We'd often have to look a long way down the road to spot a traffic light to assist us, if we saw one at all. We, like other pedestrians, took our chances and darted across the roads as best we could. 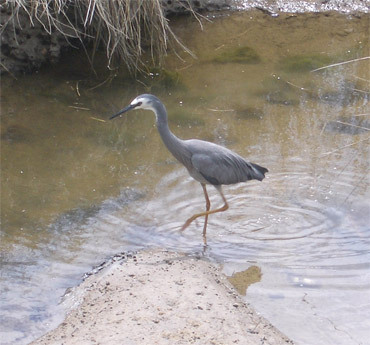 As pedestrians in NZ, we walked as tentatively as this heron. And we quickly discovered that jaywalking in the middle of the huge blocks was often safer than crossing at a light as the turning drivers rarely yielded to pedestrians, if they even looked first. Even in tourist areas where no sidewalks were provided, drivers weren't helpful about sharing the secondary road that we were forced to walk in, even if they were the only car in sight. Predictably, the ill treatment of pedestrians carried over to cyclists, and we were shown little courtesy on the road. Like in the US but not in Europe, truckers were the most aggressive. Many wouldn't budge from their sighted course, regardless of our presence, the lack of other traffic, or the existence of a passing lane. Early on we feared that it would be the many folks driving rental camper vans and caravans that would threaten us with their lack of familiarity with their vehicles, but they all give us plenty of room. Many of those drivers were likely Europeans accustomed to treating cyclists generously on the road. The disregard we felt was punctuated by having ketchup coated greasy fries heaved onto us and our bikes one day and a British cyclotourist also reported receiving obscenity-laced instructions from a passing trucker to get off the road. And the pecking order from largest to smallest appeared to be an issue in the water too. I was dumbfounded to hear of a kayaker whose craft was cut in 2 while he was in it, not even getting an apology from the power boat operator. In the US, failing to yield the right of way would have likely had the power boat operator buying a new kayak at the very least and all this Kiwi had been trying for was an apology. The formal response from the bigger boat operator was that the little guy should have been more careful, even though he was waving and sounded all of his safety equipment. The tuatara's family roots go back to Gondwanaland. The jungle-like rule of law on the roads had us reeling when in traffic; the cruel effects of the hole in the ozone layer on people's skin had us gawking on the sidewalks and in the markets; and it was the odd mix of the exotic and the mundane flora and fauna that was turning our heads in the urban and rural green spaces. Intermixed among primitive trees and ferns with fantastically ancient relatives were old favorites like rhododendrons, geraniums and the hardy dandelion. 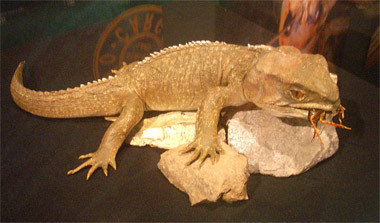 Odd reptiles with relations from Gondwanaland like the tuatara are part New Zealand's heritage, along with North American imports like mallards, quail and pheasant. And its not just US species that are around, as Australia's brush-tailed possum that was introduced in the 1800's to create a fur trade is now New Zealand's worst pest. Importation of plants and animals began with the Polynesians, who loaded their discovery canoes with all that they hoped to cultivate in order to survive on the new lands. Not many of the species they brought to New Zealand took hold, but some did. Of course, the later arriving Europeans were even more systematic in their importation of plants and animals to the strange land. "Acclimatisation Societies" operated from the earliest days of the 1860's until the 1940's to correct the "inferior landscape" by introducing new species. In addition to improving the deficient landscape, other motives were to support the sports of the homeland and to spur tourism. Over 25,000 plants were introduced by the societies, farmers and other special interest groups. 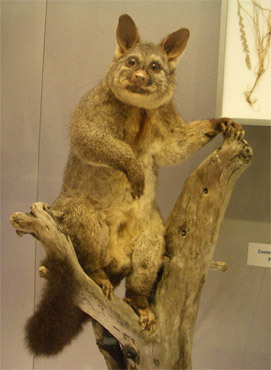 The brush-tailed possum from Australia. New Zealand is still reeling from the imbalances created in their environment from all these species introduced without their natural predators. Unfortunately, their later efforts of introducing predators often triggered yet another domino effect of unexpected ecological disasters. They haven't lost their nerve though as the controlled introduction of new species continues though at a slower pace but still with some unexpected results. The "what, why and how" of the introduction of foreign species into New Zealand is relatively easy to track, but understanding the place of the Maori people in the modern New Zealand culture is still baffling to me. I hope to have greater clarity about it by the time we leave New Zealand but upon learning that the Maori have little presence on the South Island where we were headed, it was time to consolidate my thoughts. And I slowly could see that my shortage of conclusions was in part because it is still an unsettled issue, an issue that is still very much in the making in New Zealand culture. The lynchpin of the modern conflict between the Maori and the Europeans goes back to the 1840 Treaty of Waitangi--a treaty that was signed between many of the Maori chiefs and representatives of the British government. A number of external pressures lead to an inelegant treaty being hurriedly written, including growing trade with Australia that required more formal structures on the New Zealand side; competition from the French in colonizing New Zealand; and some Europeans taking advantage of the Maori in land purchases. The Treaty suffered many flaws from the get-go, including being written by Brits without sufficient background in legal matters; not being signed by all of the tribal leaders; and (oops!) the English and Maori versions not saying quite the same thing. To further guarantee problems was the difference in the cultural contexts of ownership: the Maori, like many pre-industrial societies, believed that no one really owns the land and so "selling" it really just means temporarily granting usage of it. Increasing global pressures in the 1970's to right some of the wrongs of the first-world cultures combined with an early attitude of the Brit's to do the right thing when it came to the Maori resulted in new efforts to formally rectify some of the injustices. That process is still going on, with it getting a boost from new leadership in the 1990's. From what we can discern, at least some of the Maori and the European establishment think things are progressing towards an eventually good solution to the old problems, even though at a snail's pace. My reactions as an outsider to their process has been mixed. On one hand, the careful honoring of the Maori language with bilingual signage within public institutions and on signage seems very respectful. But this recent upsurge in the use of Maori is due to legal mandates from a reinterpretation of the 1840 Treaty, not to meet a communication need. The Maori represent 15% of the population and only 1/3 of them speak their own language and they all speak English, making the cultural sensitivity seem a little silly or misapplied. The Maori are a small minority and they are gradually shrinking in importance as a minority because of the influx of others, like in the US where our traditional minority population--the blacks--are being displaced by the more rapidly growing Hispanic minority. (That is in itself an odd battle: you are a more authentic minority if your numbers are small but you are a more important minority if your numbers are large.) If the Maori get displaced in numbers by new minorities, then should their language drop off the signs in deference to Chinese or Fijian or the language of whoever overtakes them, regardless of the late 1990's interpretation of The Treaty? I suppose the Maori would come back with the "we were here first" argument. Granted, New Zealand is one of the few places on earth where there is an end to that line of reasoning as it is quite clear that their Polynesian ancestors were the first permanent, human settlers on the land. Almost anywhere in Europe, the "who was here first" argument is endless as the migrations and power struggles had the dominant population constantly changing. But conceding special privileges to the Maori because they were here first and because they are currently are the largest minority seems to me, as an outsider, to have resulted in "The Tyranny of the Maori." We first felt that in Rotorua where all of the interesting, naturally occurring sites were controlled by the Maori with a hefty access fee--fees we rarely paid as we thought them too high. Then there was the hike to the mountain crater that is no longer a hike 'cause the Maori won't allow it. Then farther south on the North Island we saw one of a number of local lakes controlled by the Maori--lakes were no one is allowed to swim, fish, boat, manage the muck or do anything else with it. In museums, we were told we couldn't photo anything Maori. Then I was told that for cultural reasons, I could not sip water from a bottle in a museum exhibit. Excuse Me!! I rapidly found myself saying "It's time for them to get over it and live in the modern world." Trying to make sense of the uneasy truce between those of European heritage and the Maori also had us pondering the bigger issues that sociologists and other "--ists" consider, such as: "What is the responsible approach to dealing with the remaining cloistered, pre-industrial societies?" It's all but impossible to not disturb stone-age cultures these days as their very discovery means they've been disturbed. Is it ethical not to disturb them and who decides? How can one possibly let such societies have the benefits of even one aspect of modern life, like better health care, without undermining their entire society? Seeing the current mess with the Maori underscored the importance of the search to answer these difficult cultural questions and made us wonder how the Maori story could possibly have had a happy ending. The museums, info boards, and brochures in New Zealand are stuffed with sensitive displays and stories about the Maori: their beliefs, their myths, their roots, their relationship to the land, and their values. With the recently mandated government funding of Maori radio and TV stations, there is a resurgence in their language and the elders have renewed their efforts to coax the youth back into the dying arts of the old culture. But it seems that their culture has already lost its heart and we wonder if it is treasured anywhere but in the museums. Hopefully our understanding the the Maori situation will become more sophisticated over our remaining 2 months in New Zealand. As we looked back at our time on New Zealand's North Island, the laid-back, friendly English-speaking people were definitely a huge plus for us as foreign tourists and the other feature that simplified our days were their motels--they were perfect for us as tourists and cyclotourists. The equipped kitchens or kitchenettes were wonderful for preparing our own meals and allowed us to expand our culinary repertoire out to novelties like soup and toast. And we didn't have to sneak our kitchen garbage out of the room like when cooking in our rooms in Europe. We could often wheel our bikes right into the ground floor motel rooms, which speeded up our packing and unpacking process and gave us welcome confidence about the safety of our bikes. However, regardless of the class of accommodation, the beds so far in New Zealand were a little too seismic for me: the mattresses were uniformly constructed so that that every wiggle Bill made at night felt like an earthquake. And their geothermal theme seemed to carry over into the bias towards smoking hot water in the taps. The scalding hot water was great for the nights when we had itty-bitty hot water heaters, as they improved the odds of making it all the way through our showers without hitting the cold water, but it was a nuisance at the sinks. Invariably the bathroom and kitchen sinks had separate faucets for the hot and cold water, so even simple little maneuvers like rinsing hands in warm water required drawing a small basin of water (after making sure that the sink was clean). One of the prudent practices of the Kiwis still making our dinners late even after a month in the country is the convention of having switches on every electrical outlet. It would sometimes require flipping 2 or 3 switches to get an appliance going, with us often overlooking the first one in the sequence: the one on the sometimes hidden outlet at the wall (including for refrigerators). The tourist information folks that helped with our motel reservations and trip planning were especially helpful in New Zealand--consistently the best anywhere we've been. Even the woman running a tiny branch out of her crystal shop came up with more information than I expected when I walked in. Fortunately, the very best folks were at the tourist hot spots where we wanted more details on trip and activity planning and they always came through for us. As we always do, we settled into the new food routines in New Zealand. We still whined daily about the prices of food, especially when prices for things like New Zealand Braeburn apples were above the usual prices in the US, but more and more we just paid the bill and moved on. Over about a month, our average daily grocery bill was about $24NZ or $17US. That was kept down close to the amount we spend each day when traveling in Europe by avoiding the locally produced food that we just found too outrageously priced, like many fruits and chicken. New Zealanders have worked overtime in the creation of tourist activities, going beyond what we've seen elsewhere. They apparently invented bungee jumping and the zorb ball downhill activity and they've gone one step farther in offering a special transportation option between the North and South Islands. Almost everyone makes the journey by 4 hour ferry, as we will do, with a small number flying between the islands instead. But for $545NZ you can fly in a small plane and make a tandem parachute jump down onto the South Island, with the craft depositing your luggage at the Picton airport. As we were poised to hop from the North to the South Island, we learned that the Maori influence is less on the South Island. Unfortunately, we didn't hear why, so that will be a question we hope to answer while on the South Island. Other comparisons between the North Island and the South Island that we'd heard since arriving in New Zealand included that there are more people in the North, that the cities are bigger in the North, and that the scenery is prettier in the South. We've been promised substantially less traffic in the South and the northern corner of the South Island is supposed to have the best and most consistent weather in the country. We are certainly ready for the better weather and traffic conditions in the South Island, but are a little apprehensive about the smallness factor. Although we aren't hunters-gatherers in the historical sense, collecting each day's food is a focus in our traveling lives and we worry that the smaller communities and smaller stores will limit our food choices even more than they have already been. And our guide book commented that the South Island is even more laid back than the North, which is hard to imagine and certainly doesn't seem necessary. As we were leaving the North Island, it felt like summer hadn't arrived. Being December (the equivalent of the Northern Hemisphere's June) it was too early to declare summer AWOL, but it wasn't looking good. The consensus was clear however: November was dismal. We hadn't heard that it was the worst ever, but it was bad and December wasn't off to a good start. I wrote this on December 7 as yet another blast from Antarctica came across the islands, suddenly dropping the afternoon temperature in one city from 75° to 59° and dropping the snow level in the southern part of the country to 1800'. We'd been riding with our long johns and heavy mittens on for the last several days, and that was before the icy blast hit. We read that New Zealand had just had it's windiest spring in 40 years (but they only started keeping the records 40 years ago); 77 of 91 days of spring in Wellington had winds of 60 kph or more; and that they were off to the chilliest start to summer in 20 years. Yikes! Whew! We survived the journey down the west coast of the South Island through the "wop-wops" (boon-docks) and the region of high rainfall. The price to exit the wet, I mean, west coast was climbing up the 'wrong' or steeper side of Haast Pass into the central mountain region, but it was worth it. Town sizes leaped from 30 and 300 to 3,000, making us feel like we are in the big city again. We will linger in the interior of the South Island for a week or more to visit the much touted Milford Sound area before we begin our journey north along the east coast of the South Island. Fewer sand flies and less rain should brighten our days, though the traffic may pick-up a bit. The promised summer weather has yet to materialize, however.